A history of Flour Creek Christian Church from 1826 to 1894 written by Uncle Billie Wm. Jones. Dedicated on the fourth Sunday in May 1866. Circa W.W.I. The pulpit & chair by the fireplace are still in use. Harold Hornbeek, Leb Bray, Elmer Lancaster, Elizabeth Taylor and Hibbie Youngman. Silas Yelton served for almost a half century on the Flour Creek Boardand twenty seven years as Sunday School Superintendent. He died February 16, 1924 and his funeral was attended by C. O. Cosaboom. Known as Uncle Sile, he was a hard worker in the church. Miss Maymie Jones - taken in later years, approximately mid 1930's. Long-time Sunday School teacher at Flour Creek. She took many of these old photos of the early church and lived in the old house still standing on Moss Uts's place. This photograph shows the Flour Creek Christian Church located on Highway 177 at Butler in 1926. This church, one of the oldest in the county, was organized by Elder William Masters, in September, 1826, in the house of Robert Taylor, father of A. W. Taylor, where Uncle Jones, as he is called, now lives. It was started with five charter members, as follows: Robert Taylor and wife, John Yelton and wife, and Cynthia Ellis - two men and three women. At the time of organization the members framed their creed as follows: "We agree to take the scriptures of the old and new testaments as the only rule of faith and practice; assuming no other name than Christian, first given the disciples at Antioch." From this time on this church was known as Flour Creek Christian Church. This small band of disciples met for worship for a short time in Bro. Taylor's house, which stood on the farm of said Robert Taylor, about 50 yards north of where the present frame church now stands. This school house was a small building with rough benches for seats, and but little room. In the close of the year they called Elder George Fisher to preach for them; he accepted the call and preached for them for some years, meeting being held in the log school house each month. At the monthly meeting in 1828, it was agreed by the members to hold communion service twice in the year - June and October. In November 1829, the members bought and presented Bro. Fisher with a new saddle, $15.00. At another time they gave him a suit of home-spun jeans, woven and made at home. At other times they gave him articles needed to live on such as meat, bread stuff, etc. Thus the preacher was paid in those days. Sometimes he would ride horseback and sometimes walk to his appointment from home, which was about six miles away. There were no railroads or turnpikes nor buggies in those times. The people traveled on mud roads, horse back or on foot. The preacher and the people all dressed in home made clothing of uniform style and make. Sometimes the preacher would have on a coat patched at the elbows or pants at the knees. You may doubt this statement, but ask some of the old folks about it. Bro. Fisher continued to preach for them - still meeting in the school house - till the spring of 1832, when it was agreed by them to build a larger and more commodious house in which to hold services. Robert Taylor made a deed for a lot of one-half acre of land on which to erect the church building, and gave it as church property. On this lot, during the year 1832, was erected a hewed log house, about 40 feet long by 30 feet inside, on or near the place occupied by the present building. This house had two doors, one at the east end and one at the north side with an aisle running from each door through the center of the house each way. One from the east door ran to the pulpit in the west end, and the other ran across from the north door to a window in the south side. The seats were long benches made to reach from the aisle to the wall, all around, leaving just room for a person to pass between the benches and the wall. No carpet was on the floor, as carpets in churches were then unknown. The house was lighted at night by tallow candles; some standing on the pulpit, and some on a small table or hung on the side of the wall. Someone would pass around two or three times during the service and snuff or top the candles, generally topping them with the fingers. Sometimes the candle would be put out and have to be relighted. This was long before oil lamps were known or thought of. Coal oil, gasoline, electric lights and all such were then unknown and unheard of; consequently the light was not as bright and good as we have now, but the people had nothing better than was known, so they were contented and happy with what they had. There were three or four small windows in this old house, with no curtains or blinds hung over them. They were made just for the purpose of admitting light. No stained or colored glass was in them, only plain 8 x 10 glass. Nothing was made for show then, but made for service and comfort. When the members met for worship and the time for prayers were announced, everyone would kneel right down upon the floor during the prayers. This was the custom then; nobody ever thought of standing up to pray; all knelt down to pray, old and young, and some of the children were taught to kneel with the older ones. And the singing! Oh how they did sing; They just made the old house ring. When they sang a song they meant it. They sang with the spirit and the understanding also. There were no notes or music books used then in the church; the song leader or preacher generally had a small song book (words only) and would line out the hymn - two lines and sing them, then two more and so on through the song. Thus all could sing and follow the leader. There was an advantage in this method of singing in the church. Those who could not read could sing when the song was lined out, and there were many of them then, and perhaps even now. This good old custom is still in vogue in some churches at this time. You will please remember the church at this time was in its babyhood state, and of course could not be expected to do as much as older and stronger ones. There were but a few members and most of them were poor in this world's goods, and of course had to live within their resources. There was but little money in circulation, and the people didn't have as much of it to spend as we do now. When the preacher was called to preach, he would never ask how much they would pay him; he would go and preach for the church; and when the work was done, he would take whatever the church could afford to give him. The preachers in those days were men of age and were called Elders, the title Reverend was not given then to the preacher. 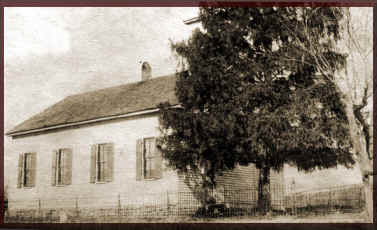 After the new log house was built the church increased its membership, and did more and better work in church matters. Let us suppose we can look back to the time when the members moved into their new church house and see some of our gray-haired grandfathers and grandmothers, as they sit upon those long benches and eagerly listen while the gospel is proclaimed to them by the memorable old brothers. Let us take another look inside that old church and imagine in our minds, we can see that grand old veteran of the cross, old Father Fisher, standing in that old pulpit as he preaches to the people. Some of the older ones of my readers will remember him as they heard him preach in that some old house. And that old pulpit, how do you think it looked? Not like the ones we have now, say you. No, let me try and tell you how it was made. It was about six feet long and nearly as wide, all boxed up in front and one side, the back being the wall of the house, and one side open for the preacher to go up. From the floor were three steps to go up, and a bench along the wall back of the stand for the preacher to sit on. When sitting upon this bench the congregation could only see his head over the top of the stand, and when he stood up to speak and put his hands on top of the stand, you could see only from the elbows up. This old pulpit was painted a dark green color and no doubt was considered a very fine one in those days. To give you some idea of its size and style, let me tell you it was once used as a blackboard by a music teacher to illustrate his lessons to his class. From this novel blackboard the writer learned his first lesson in music many years ago. Now let us go back and get a few items from the old church book. At the church meeting in January 1836, it was contrary to scripture for this church to prosecute a suit at law against another member without first bringing it before the church. At the January meeting, 1836, the members resolved to change the communion from twice to four times a year - January, April, July, and October. At the monthly meeting in January, 1839, it was agreed by the members that they pay Bro. Fisher the sum of $30 per year for preaching. This was only $2.50 for each visit. Do you think our preachers now would walk or ride horseback 12 miles and preach monthly for this amount? I have been told by my mother that Bro. Fisher would have to leave his horse at home for his boys to plow and work with while he came to his appointments and preach at Flour Creek, and walk to and from home, returning Monday morning and go to work on his farm. The preachers then were laboring men and would work on their farms or at their trade all week, and go and preach on Saturdays and Sundays. They depended upon their labor for a living and not upon their preaching for a living as some do now. Robert Taylor, being the first Elder of the church, and having served in this office faithfully and well, it was thought best to select some other elders in this church. Accordingly in December 1841, Benjamin Yelton and Ferdinand Taylor ( son of Robert Taylor ) were chosen as elders. The congregation by this time had increased in members and had become a very large and growing church. We have no record of the number of members at this time, but have gathered these facts from old persons who were members in those days. Most of the old time servants of the Lord are gathered home to the land of light beyond the rolling river, while some few are left waiting on this side, who were members of this church long ago. 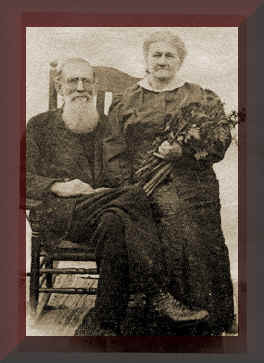 Uncle John J. Yelton, Aunt Sally Williams, Sally Taylor, and a few others are all that are left of the old time members. You must not suppose that there were no other preachers, but Bro. Fisher in the early history of the church. There were others that preached some part of the time. Elder John Powell, an old elder and veteran of the cross, preached sometimes, as did Elder George Vanderman, another old soldier of Jesus, and others. I have been told that the Baptist brethren would come and preach in this church sometimes, and perhaps others of different denominations, the house being open for all, when not being occupied by the disciples. The church in those days generally kept their preacher when they got him and did not change preachers often. I have been told Bro. Fisher preached here most of the time form the organization until his death. The church at this time (1841) was about fifteen years old, and was much stronger in membership, and having elected new officers it was prepared to move on in more and better work. Bro. Ferdinard Taylor, son of Robert Taylor, being the Elder at this time, took the place of his father who was growing very old and feeble, and of course unable to attend to the active duties required of him. There were also other Elders at this time - Dudley Dunnaway and Benjamin Yelton. They have served their terms of office and have gone on to reap the reward of the faithful, and have left the work of the church to be done by others who may be assigned the duties of this office. In December 1840, Bro. Fisher was employed to preach one year for four churches in the county of Pendleton, namely; Flour Creek, Grassy Creek, Holt's Creek, and Falmouth. Each one of the four paid their part as follows: Flour Creek, $75; Grassy Creek, $55; Holt's Creek, $50; Falmouth, $30, total $210. This was paid Bro. Fisher for preaching one year for the four churches, once a month for each church. In November, 1845, Bro. Fisher and Wm. 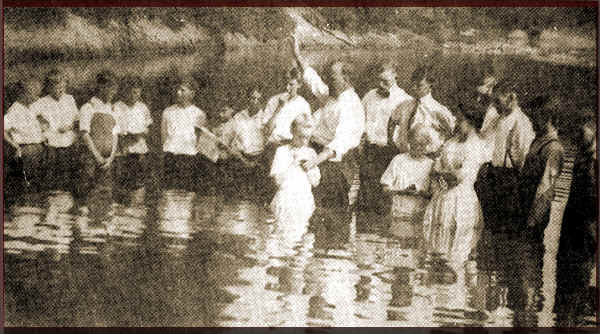 Masters held a protracted meeting at Flour Creek, resulting in seven being added to the church by baptism. From 1845 to 1865 we can not find any record of the church, so we must write from memory and what we can gather from others. Along about this time Alexander Anderson and Fisher traveled and preached together. They would hold protracted meetings, and were most of the time together in the work. Many of my readers will remember Bro. Anderson (Sandy, as he was called). He had the strongest voice of any man I ever knew. It was said he could be heard, when preaching, by persons far away form the church. He was most earnest and faithful preacher. During their travels and preaching together we remember a grand good meeting that was held by them at Flour Creek in March and April of 1857. It was perhaps one of the best meetings ever held here. There were some twenty men and women brought into the church and baptised at this meeting, and the church strengthened and prepared for more and better work. Soon after this meeting there were two strange and young ministers who came to Flour Creek and wanted to hold a meeting. Their names were Jacob Hugely and J. C. Arnsparger. They commenced preaching and soon their fame spread abroad, and everybody wanted to come and hear them. They also did some work for the church, and added some more members. These were perhaps the first young preachers that had ever been heard here, as old Father Fisher had been the preacher for the church most of the time since it was organized. The young men remained here and preached for some time; then they were called to other fields of labor. 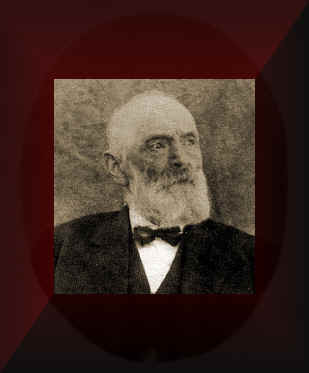 Robert Taylor, the first Elder of the church, was called to his reward December 11, 1851, aged 93 years and 4 months. In 1863, Bro. Fisher was called to his reward after serving the church as pastor for over thirty-five years. As a tribute of respect I cannot offer a better than a notice of his death written at the time, which I copied. "Our venerable and beloved brother, George Fisher, completed his earthly pilgrimage on the 28th of August, 1863, aged 71 years. He was an able and efficient minister of the gospel, and one of the pioneers of the reformation. He had spent forty-nine years of his life in advocating the cause of Christianity. He died of the flux, after having an illness of nearly three weeks. It was his request to be laid quietly in the grave without any show of funeral pomp, and to be buried by his son, Daniel Fisher, also a minister of the gospel. Thus Father and son rest from their labors, and side by side their bodies repose till the uplifted curtain shall reveal the last grand drama in man's redemption. There let them rest where sorrow heaves the troubled breast no more, where the tear of grief dims not the eye, and the stormy waves of life roll on unheeded. Death hath no troubles for the dying Christian. Our aged and worthy brother had spent the greater part of his life in pointing a dying world to that glorious luminary that arose in beauty on Bethlehem and went down in blood on Calvary, leaving its light to shine as the beauty and blessing of this world. He had caught its reflection, and knew his savior had wrested from the hand of death the grasp of the grave - the light of Calvary had guided him safely to his eternal home. But we who have grown up under his teaching will sadly miss him, for we feel the need of his sage council in a time so fraught with danger." In 1865 the old log building was found to be too small for the large number of people who attended the meetings, so it was decided to pull it down and replace it with a larger and more convenient house. The members went to work and soon had enough money subscribed, and the work of tearing down commenced. The material of the old house was sold, and he proceeds added with the sum for the new. James Holmes, father of W. W. and J. W. Holmes, was employed to erect the new frame building, which now stands. On the fourth Sunday in May, 1866, Bro. Benjamin Franklin, editor of the Christian Review, preached the dedication sermon. The people prepared for a basket meeting and, of course, everybody went. There was supposed to be over 800 people present. It was a stormy day, as many of you will remember, the wind blowing a perfect gale all day. It was more like a March day than a May day. The meeting was continued by Bro. Franklin for one week, each day and evening, which resulted in about twenty additions to the church. Bro. Franklin was a very prompt man and would begin the services at the exact appointed time without regard to the congregation. It is said of him that he baptized more than ten thousand people during his ministry, wrote many books and tracts, besides editing his paper, the Review. His death occurred on Oct. 22, 1878. In 1867 Bro. Wm. Kirkwood was called to preach at a salary of $100. He was a laboring man and worked all week at his trade. He was not an educated man, but was one of the purest and best of men. No one could speak ought but good of him, and all who knew him loved him. In 1868, Bro. Henry Hathaway of Covington, was employed to preach. Salary optional. In 1869 Bro. Knight preached for a salary of $200. He also stayed a portion of the next year, when he was called to go to Indiana, after which the church was without a minister for some time. In 1871 the church chose the following officers, who were ordained by the laying on of hands, by Bro. Neal: Elders - J. H. Thomasson, C. C. Houston and J. C. Bonar. Deacons - J. G. Yelton, Silas Shomaker, James Webster and S. A. Yelton. Bro. Neal was again employed for 1873. In August of this year the first missionary meeting, or old folks meeting, as it was called, was held. This was the first annual meeting. In September 1873, Bro. Neal resigned and went to another field. In March 1875, Bro. 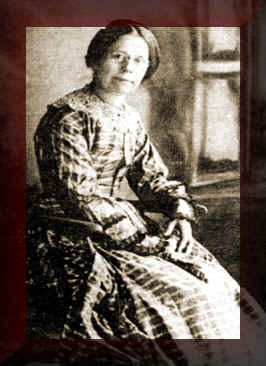 Ridgeway was called and preached twice a month. During this year he and Bro. Hawkins held a protracted meeting resulting in great good to the church. Bro. H. B. Taylor, of Falmouth, was called for two years 1877-1878 at a salary of $200 per year. In May, 1878, the second annual meeting was held with a large crowd and a grand good meeting. The church had been in operation for about fifty years, and the membership had increased till there were over 150 names on the books, some of them living several miles from the church. Some lived in what was known as Lovejoy district, and some in Butler and other places. Old Flour Creek is the mother of two or three churches, as we shall see further on. In January, 1879, some thirty of the members applied for and were given their letters from this church for the purpose of organizing a Christian Church in Butler; and on Feb. 2, 1879, the church was organized with some twenty-five or thirty members. After its organization a number of other members of Flour Creek were given letters and took membership at Butler, thus decreasing the membership of the old church. The Butler held services in what was then known as the union church over the town hall. The meetings and Sunday School were held in this buiding till the new Christian Church was erected in 1885. The dedication service was preached by Bro. R. Vanhook, of Alabama, on Dec. 27 of this year. This church has grown to be the largest in membership and among the best working churches in the country. This church may be called the youngest daughter of Old Flour Creek. In March 1879, Bro. H. B. Taylor, of Falmouth, was called to preach at Flour Creek for the balance of the year. In May the third annual reunion was held, with Bro. Taylor as leader. These meetings were participated in by members of other churches. From January till May, 1880, no meetings were held. In April Bro. W. P. Houston was called for the balance of the year; and in May the fourth annual meeting was held by Bro. Limmerick. In 1881, Bro. John Limmerick was employed, and in May the fifth annual meeting was held and conducted by Bro. R. B. Neal. Bro. Limmerick remained with the church during 1882 and received $100 as salary. He presided over the sixth reunion. These meetings were now becoming great events, being attended by people far and near. They were all day meetings with dinner served a the church. A sermon was preached at 11 o'clock and the Lord's supper was taken. Then dinner was served; and after a recess of some two hours, a social meeting was called, in which songs, prayers, and short talks were called for, and participated in, by members of various churches, and to judge by the interest taken, everybody seemed to enjoy themselves. 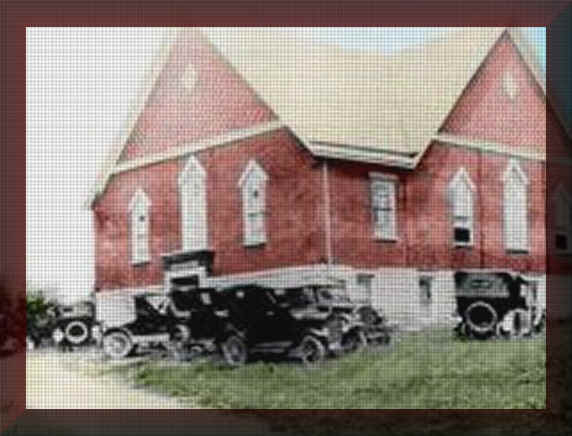 In March, 1883, about 40 members of the church were given letters for the purpose of organizing a church to be known as Pleasant Hill Church, the building for which was built that year and dedicated on Sept. 2, at which time the church was organized. This may be called the second daughter of Flour Creek, and it has grown and prospered till it is now among the leading churches in the county. The membership in the mother church was reduced to comparatively few, and had to make a new start in the work. On the third Sunday in May of that year the seventh annual meeting was held with Bro. H. B. Taylor as chairman. In September, 1884, it was agreed by the members to reorganize and choose new officers, as most of the elders and deacons had been given letters to Butler and Pleasant Hill. The following brethren were chosen to serve as officers: Elders - Peter Howe, James Holmes, and Wm. Holmes; Deacons - B. Tucker and O. Dunaway. The church at this time was without a preacher and had but 25 or 30 members, and held no meetings of any kind for a while. Some said that old Flour Creek Church was dead and buried and would never be resurrected; but we shall see that this prophecy failed to be true. Some of the officers and members said that the church should be awakened and put to work to do it. On Nov. 9, 1884, Bro. John Lemmon, then preaching at Plum Creek, was invited to come and preach a few times, which he did, and had good meetings the balance of the year. Bro. 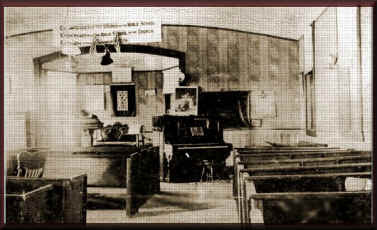 Lemmon was employed to preach once a month during 1885 for $50, and during this year 20 members were added and new life was injected into the sleepy old church, and from that time to the present the church and Sunday School have been in successful operation. So you see, it was not dead; for a spark of life was left that was fanned into a blaze and the result is a live and flourishing church. In September, 1886, Bro. Lemmerick held a meeting which resulted in adding seven members by baptism. During this year Bro. John Edwards was chosen as elder, and in October, a new roof was put on the building. In 1887 a protracted meeting was held by Bros. Limmerick and Wells, the result of which was nine more additions. In 1888 Bros. John Beasley and Limmerick held a meeting, but no additions were reported. In January, 1890, Bro. E. B. Barnes of Lexington College, was called at a salary of $75. At the July meeting, Bro. Henry Stewart, also from the college, visited the church with Bro. Barnes, and in August they held a protracted meeting during which sixteen new members were added to the church. At the September meeting twelve more joined the church. In December two more elders and three deacons were selected: Benjamin Tucker and O. Dunaway, elders; J. N. Taylor, S. A. Yelton, and R. C. Taylor, Deacons. With more officers and an increased membership the church was prepared to do more and better work. In April of this year the building was papered, which added greatly to the appearance of the interior of the house. The annual meeting was again held in May with Bros. Taylor of Falmouth and Barnes, Devoe and Houston, of Lexington College in attendance. A very large crowd attended this meeting. In October of 1890 Bro. Barnes held a protracted meeting, during which eight members were added. In November he was called to take charge of the Christian Church at Bowmansville, Canada, and Bro. Devoe filled out the year. In January, 1891, Bro. 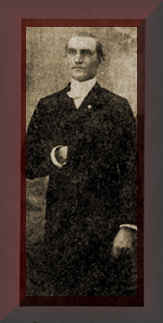 Herbert Saxby of Bible College, was called and preached during the year receiving $120. In May this year the annual meeting was again held, and a very large crowd was in attendance including Bros. Barnes, Devoe, and Saxby. During this year the house was crowded at every meeting. Bro. Saxby was again called for the year 1892. On the fifth Sunday in May the reunion was held with Bro. Saxby as foreman. The day was rainy and unfavorable, but a small congregation was present, but was enjoyed by all who did attend. In August, Bro. Barnes visited us from Canada and held two week meetings with Bro. Saxby. Only two additions were reported at this meeting. Bro. Saxby remained till the close of the year and was called by the church at Antioch Mills. In January 1893, Bro. Cecil Armstrong, form Australia, was called and proved to be a good workman, doing all he could for the church, an had good congregations every month. On the second Sunday of May the last annual meeting was held with a very large attendance. The house was filled almost entirely by ladies, but few men being able to get a seat. It is supposed that there were as many people on the outside as there were inside he house. It was the largest crowd of people that had met at old Flour Creek for many years, and everybody seemed to enjoy the meeting hugely. In August another protracted meeting was held, Bro. Taubman, of Falmouth, doing the preaching. There were full houses at all the meetings and there seemed to be great interest taken in the meetings, yet there were but two additions. Bro. Armstrong closed his services with the church in December 1893, and for the present year Bro. Davy, of Lexington, has been employed. The total members of the church from its beginning to the present time has been 678. This church is now nearly 68 years old, and has in that time done great good, and we trust has been the means of converting many souls from sin and leading them to the happy land above. She has passed through many stormy and critical times, but lived through them all and is still moving along. May she live many long years and do still more for the salvation of the race. Now, kind readers, here ends my reminiscences of the oldest Christian Church in Pendleton County. I have endeavored to give you a true and impartial history of the church from its organization to the present time. The most of it was taken from the church records and from what I have gathered from the older members. Hoping what has been written may instruct, interest, and benefit all my readers, and that, after the labors of life is o'er, you and I and all that are trying to serve the Lord, with all good gone before, may meet in the happy land beyond the rolling river, is the wish and prayer of the writer." To continue the history of Flour Creek Church - In 1977 Flour Creek Church celebrated 151 years, and the following was written by Carolee Johnston. With the celebration of the 151 years of the Flour Creek Christian Church it is important to know its history. Many of our ancestors served as deacons or elders and others were active members in the church. Many generations of the same family still attend and even relatives of the founders of the church are still in attendance. In 1893, church services were held in the white, framed church, which was the second church built. Services were conducted by Bro. Armstrong until 1894. Services were held once a month, due to the minister having to fill obligations at other churches. Communion was partaken only twice a year. Members were even excluded from the church because of their wrong doings or their negligence of duties of the church. Bro. Davey became minister in 1894 with a salary of $120 a year for one Sunday a month. Bro. Davey's term was followed by Bro. R. Steward in 1895. An organization called the Endeavor Society was formed in 1899. This group was for the interested young people so that they could play an active part in the church. During the summer the church would hold protracted meetings. These meetings were very similar to revivals. A guest speaker came and conducted the meetings. These meetings lasted one to two weeks with immense crowds there every night. There was much singing and good old gospel preaching. They held this meeting during a full moon so that people could see to drive their horse and buggy home. There were four ministers in the next five years; Bro. David Crabtree, 1900-1901; Bro. Randall, 1902-1903; Bro. Laurance, 1903-1904; and Bro. 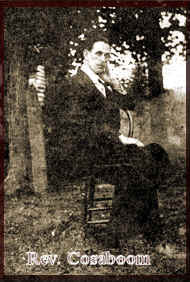 J. J. Cole, 1904-1905. Changes took place in the church around 1904. Carpet was bought by the ladies class for a price of approximately $20. Lights were installed in the church by a type of light called "F R" lights. This type of light was run by a generator. Bro. H. F. Webb was selected as minister in 1907. In that year the church got a new look and some needed repairs. The building was re-roofed, the walls inside papered and new windows were installed. A dedication was held on October 6 along with a grand celebration. After the resignation of Bro. Webb, the church voted to hire Bro. C. O. Cossaboom as minister in 1910. Bro. Tinsley who followed him in 1913, held services twice a month until 1915. The following were from 1916 to 1919 respectively; Bro. Tinsley, Bro. Lykins, Bro. Roscoe Thompson and Bro. Tim Tinsley, each serving one year. At the end of 1919 there had been 979 members of the Flour Creek Christian Church. A great change was made at the turn of the decade for the Flour Creek Christian Church. A new church, constructed of brick and concrete was built. Male members of the church helped with its construction. The dedication was celebrated on June 20, 1920. A dinner was served at the Taylor Spring, which was across the rock quarry on Flour Creek Road. Bro. Diehl held the services and was minister until 1922. It may be interesting to note the budget of the church in 1921. The minister's salary was $750 a year. Coal cost $50 and the light bill was only $25. The church board members term of office was for life, but in 1921 the length was changed from life to only one year, re-electing new officers each year. A new piano was bought for the church in 1923. This piano was purchased by members of the church who made pledges. They pledged a certain amount of money to the church for each year. This system was used for expenses of the church. Weekly offering was not in practice at that time. Bro. Herb Tinsley was minister in 1931. He held services on one Sunday a month. Bro. Tinsley stayed until 1935, during which time he held numerous revivals. A revival was held July 9 - July 19, 1931 with pastor T. H. Tinsley presiding over the services. There were as many as 287 people present on one night. Many visitors came from the surrounding churches. This was one of the many successful revivals held. Bro. Lee Tinsley, the pastor Herb Tinsley's uncle, held a revival for two weeks in August of 1932. The revival was very successful in which eight persons took baptism and nine took membership. A very rewarding revival campaign was conducted from August 5 to August 19 in 1934 by the pastor T. H. Tinsley, assisted by Bro. John Chambers of New Liberty, Kentucky from July 29 to August 11. Even though the weather was unusually sultry, an excellent crowd turned out. After pastor Herb Tinsley's resignation in 1935, Bro. Paul Holderman took over as pastor. He served until 1938 at which time there was no pastor for two years. In 1940 Bro. P. M. Runner was hired as minister, but stayed only one year. Then in 1942, Bro. 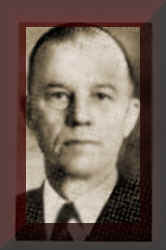 Felton agreed to serve as pastor of the church, serving till 1944. Bro. Casey then served as minister from 1944 to 1945 preaching two Sundays a month. July 2 to August 5, 1945 were the two weeks of revival held by the returning minister Bro. Herb Tinsley. The revival was well attended in spite of gasoline rationing. In 1946 a motion was passed by the church board to discontinue the practice of taking pledges. Offering was then taken each day that preaching services were held. Rev. Purvis served as pastor from 1946 to 1948, preaching only once a month until 1948 when he began preaching twice a month before resigning. Rev. Woodrow Jones was hired as minister in 1948 for two Sundays a month. The other two Sundays, he held services at the Butler Christian Church. He was paid thirty-five dollars a trip. Due to illness, he had to resign in 1950. In 1949 the church got a new public address system. In 1950 the board voted in favor of a young people's organization. This organization was to be known as the Christian Youth Fellowship which is still in existence. Bro. La Moine Waldron was pastor of the church from 1950 to 1953. During his term the church got a new look and some needed repairs. The sanctuary was remodeled. Baptistery, pulpit and choir loft were added to the sanctury. A false ceiling was built to save heat that the new automatic heating system would circulate. Also a new rug and new song books were bought. Bro. Anderson followed Bro. Waldron in 1954. In 1957 David Pollitt was hired as the first full time minister at Flour Creek. He was given $40 a week, $4 pension and ninety five cents for traveling expenses. In 1958 the church rented Harry Taylor's house to use as a parsonage for the minister during the summer months.. In 1959 a committee was appointed to write a church constitution. This constitution was then put before the congregation and was approved. A mobile home was bought in April of 1962 to use as a parsonage. The trailer set between the church and the Fryer property, where the parking lot is now. David Pollitt resigned as minister in 1960. Bro. Richard Bevan was hired in 1961. The tradition of giving flowers to mothers on Mother's Day was started in 1962. New furniture was bought for the sanctuary in 1962, consisting of a new pulpit, a communion table and a set of four communion chairs. The furniture was dedicated on June 24, 1962. Later in that same year the Christian Women's Fellowship bought new pews for the church. Land was bought in 1963 from Mrs. Lillie Fryer for a parking lot. Ground was also bought from Mr. Thomas Utz for a church parsonage. Bro. Bevan left the church in 1963 at which time Rev. Ralph Glenn was hired as minister. At the end of the year 1964 there were 169 active members in the church and 29 non-participating members making a total of 198 members. The average Sunday School attendance was 96. There was an average attendance of 110 at church services, with 163 being the most in attendance on one Sunday. Rev. Glenn resigned as minister of the church in 1966. The congregation voted to hire Bro. Dennis Chandler to replace him. In 1967 Rev. Dennis Chandler resigned as minister. He was followed by Rev. David Troxler in 1968, staying until 1973. In 1971 the church built a nursery above the stairway of the church. The church constitution was also revised in 1971. Rev. Earl Turner was hired as minister in September of 1973. He resigned in 1975, due to illness. Bro. Paul Thornberry of the Falmouth Christian Church held services until July 1976 when the present minister, Rev. W. Philip Coe was hired. The Flour Creek Christian Church is now 151 years old. I hope that in another one hundred years someone else will be writing about 251 years of the church. Let's do all we can to make that possible and be proud of the Flour Creek Christian Church.